Hazel is one of the coolest Mac apps for productivity geeks I’ve come across. If you like the idea of automatically moving and renaming documents on your computer, then this is the app for you (and that’s just the beginning). Hazel is a system preferences app that you can train to watch certain folders on your Mac. 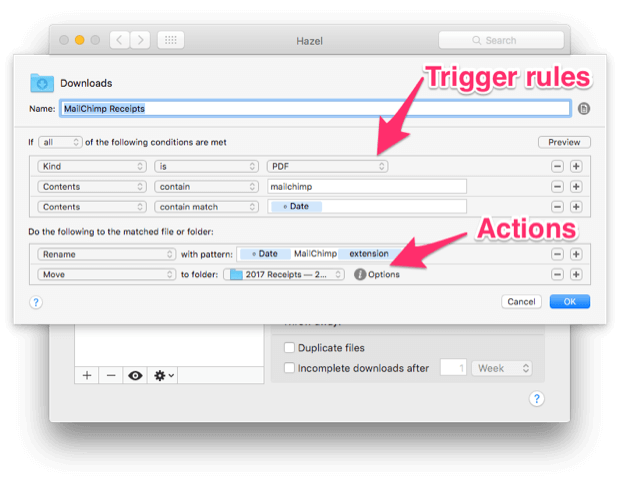 When files or folders within that target folder meet certain criteria, you have Hazel perform actions on those items. Clear items from the downloads folder when they’re more than 7 days old. Rename statements, receipts and invoices and move them to a separate folder where you keep everything organised. Automatically convert images into PDFs. Tag or add a label to a file if it contains certain keywords. You can also set Hazel to automatically empty your Trash when files reach a certain age or if the trash gets too full (e.g. greater than 1GB). And when it comes to uninstalling apps from your Mac, you can have Hazel scan the computer for small system files that apps often leave behind. In a nutshell, Hazel is your all in one virtual assistant for keeping your Mac clean and tidy. In this video, I’ll show you the basics of Hazel and one of the coolest features – the ability to rename files based on dates found inside the file. This is great for invoices and receipts where I like to name the files based on the invoice date (and not the date the file was downloaded or created). Automatically OCR images with Hazel and PDFPenPro (this is where I got the AppleScript I used in the video). Automatic document redaction with PDFPenPro (great for hiding sensitive information within documents). There's also a tonne of great Hazel tips in the Hazel support forum. If you’re already using Hazel, please let me know what kind of things you’re automating. I’d love to learn more about how people are saving time with this app.